After comparing dozens of brands and going through customer feedback, we have settled on the following three American fridge freezers. Looking for a large fridge freezer that is also stylish and attractive? 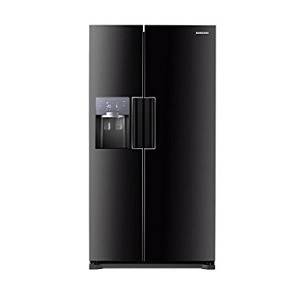 Then take a look at the Russell Hobbs RH90FF176SS fridge freezer. Got a big house with the entire nuclear family staying over? Bigger, stronger, powerful and fitted with the latest technologies for unrivalled performance, the Samsung RS7667FHCBC American fridge freezer beats the competition from all angles. If you want a decent fridge freezer for your home without spending too much, this is it right here. When you consider the cost, then it’s obvious that the Hisense RQ560N4WC1 is a feature-packed fridge freezer with excellent value for money. What is an American Fridge Freezer? Got oodles of space in your kitchen and an even larger family to feed? Then there’s really only one fridge for you. Also known as a Side by Side or Double Fridge Freezer, the American fridge freezer is a two-door model that’s grown increasingly popular over the years for a couple reasons. For one, the mammoth size means greater storage capacity. 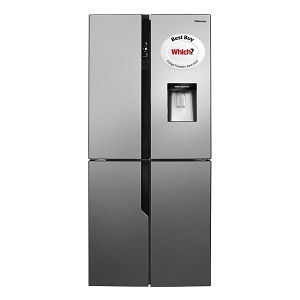 Secondly, these fridge freezers are sleek; stylish, and come with an extensive array of special features and useful add-ons such as ice machines, water dispensers, separate thermostats, and a deeper profile. However, all these features and bulk means that your fridge freezer will require a large area to sit in. Not to mention how it’ll also need to be plumbed into the water mains. With all the great brands and their jargon-heavy specs lists, whittling down the right model for you can be a bit overwhelming. After all, you’re only buying a larger than life, uber expensive appliance that will serve you for decades; so no pressure. But not to worry, we’ve compiled this guide to point you in the right direction. Here are a few factors to consider when making your purchase. Typically measured in litres, the size and capacity of your fridge freezer will dictate the amount of space you have to store food. While a high capacity is obviously the more desirable choice, make sure you consider the amount of space in your kitchen as well. The design and finish of your prospective fridge freezer will play a huge role towards complementing your kitchen décor. The classic white design is easy to keep clean and is cheaper when buying. Stainless steel models, on the other hand, bring a sleek, professional look to your kitchen. Manufacturers are always adding value to their fridge freezers. From special design techniques and styles to features and gadgetry, here are a few must-have features to look out for. Ice and Water Dispensers on the outside of the door can be a godsend because they save valuable time and energy of opening and closing the doors. A Good Salad Crisper that is well sealed will keep your veggies fresh and save you from using plastic bags. Separate temperature controls will allow you to set independent temperatures in both the fridge and the freezer without affecting the other. The RH90FF176SS from Russel Hobbs is an American Style fridge freezer that boasts of separate cupboard style fridge and freezer sections. It comes in a range of different stylish and vibrant colours with exceptionally large handles. This makes it both easy to use and strikingly beautiful. In addition to style, the RH90FF176SS provides excellent storage capacity with the total fridge storage capacity of about 345 litres and a number of utilizable storage racks and drawers for convenient storage. The freezer section packs a capacity of 192 litres and is fitted with an ice maker, optimizable storage racks, shelves, drawers, and a solid airtight door that will keep even significant amount of your food fresh for days. Thanks to an intelligent layout, numerous door racks, shelves and drawers in the fridge and freezer let you store your food neatly in an organized manner. The fridge also comes with separate wine racks for storing your wine bottles. The RH90FF176SS incorporates the option of adjusting the temperature as per your requirement with the help of the adjustable thermostat. And to top it all off, it won’t cost much to run thanks to its A+ energy rating and 4-star freezing rating. Do you enjoy your drinks and want even more convenience accessing them? With the Russell Hobbs RH90FF176SS fridge freezer, you’ll never be short of space or go thirsty. Along with 5 door racks, four shelves, and several drawers, this fridge freezer comes with a four bottle wine rack to store your favourite Sauvignon. But the drinking games don’t end there. The manufacturer also incorporated an ice maker in case you like it extra chilled. The icing on the cake (no pun intended) comes in the form of anti-frost technology that ensures no more time consuming defrosting. As expected, the ice maker in the freezer will require some plumbing to be done in advance. But since fridge freezers are installed permanently in your kitchen, then the plumbing will definitely pay off in the long run. No more manual refills. Likewise, I also noticed that the door hinges weren’t really lined up square, but that issue was sorted out by some simple screw adjustment. In fact, you just might have to unscrew and remove the doors entirely if your kitchen doorway is too narrow. Checking out what other customers have to say about a product is always a good way to test the waters without making any financial commitments. At the time of writing, the Russell Hobbs RH90FF176SS fridge freezer had a 4.4 star rating with some pretty colourful reviews. Most customers claim that it’s an excellent piece of technology that performs almost as good as it looks. However, others can’t seem to get over the RH90FF176SS’s 43dB hum. Looking for a large fridge freezer that is also stylish and attractive? The Russell Hobbs RH90FF176SS fridge freezer not only has the storage capacity fit for a large family, but its stylish outlook also makes your kitchen look even classier. Likewise, users will appreciate the clever storage organization and separate shelves, racks and drawer arrangement. Combine space with functionality today by getting yourself this beauty from Russell Hobbs. As any good chef will tell you, cooking is all about presentation. Boasting of a sleek style heightened by smooth lines and a polished finish, the Samsung RS7667FHCBC incorporates a premium feel that complements and elevates your entire kitchen. 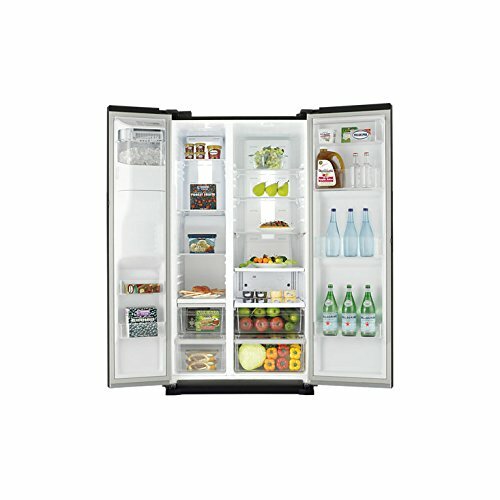 This contemporary elegance of the Refrigerator is sure to inspire dazzling and scrumptious meals. But this bad boy doesn’t just look good; it’s got the features, space, and technology to back it up. You just can’t beat a deep profile with a 545-litre net capacity. Samsung puts all the information and control right at the tips of your fingers. Thanks to the external LED display with a pleasing glow, you can know what’s going on in your fridge and freezer without even opening the doors. It shows the inside temperatures for both sides of the RS7667FHCBC and even lets you know when its time to change the filter. The touch display also works the water and ice dispensers. The ice dispenser is built right into the door and can store a whopping 2 kg of ice. The easy-opening doors that allow even the youngest gourmet to open the fridge freezer are a nice finishing touch. As opposed to sticking out into the kitchen space, the EZ Handle is actually inset into the door. Not only does this add a touch of elegance, the smartly designed handle enables the door to open with practically the touch of a finger and minimal exertion. I also liked the way the LED lights run down the back of the interior instead of the standard top so you get more space and less heat emission. There’s no other way to put it; making use of the latest technology to give you the highest quality performance is what the Samsung RS7667FHCBC excels at. The first advanced tech incorporated is Samsung’s Twin Cooling Plus System. This gives users the best of both world by using two separate air flows and precise temperature control to maintain optimal humidity levels in the entire fridge. This Twin Cooling Plus System not only helps keep your fruits fresh and prevents your ice cream from getting freezer burn, it also stops ice cubes from smelling or tasting like other foods in the fridge. 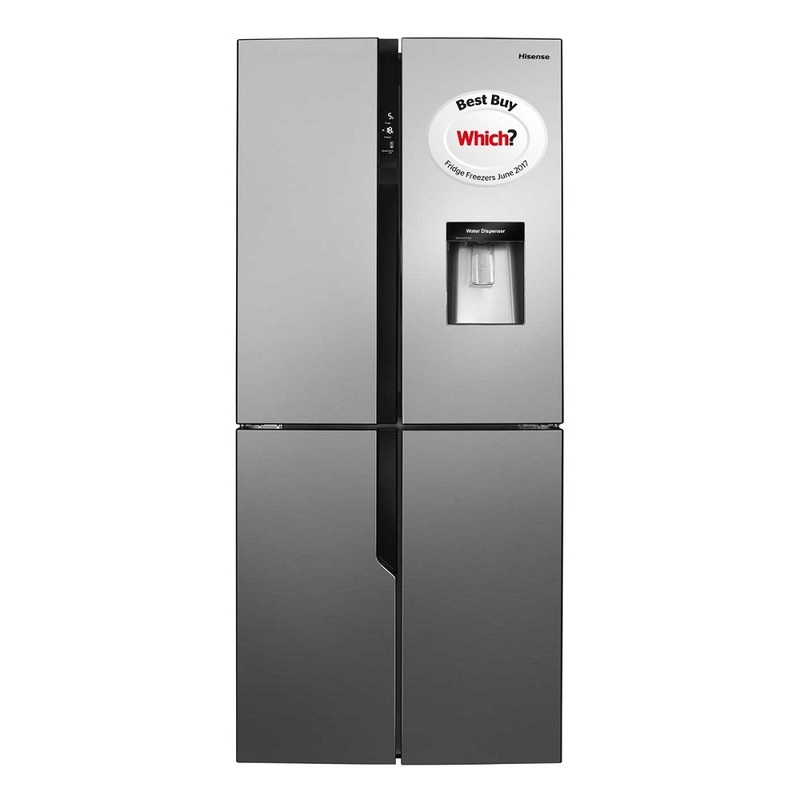 Just like most other fridge freezers with built-in ice and water dispensers, the Samsung RS7667FHCBC will also require some plumbing. But once you’ve got all the piping done, you can enjoy an uninterrupted flow of cold water as well as a choice between crushed and cubed ice. I also noticed that the handle is a bit fragile, so take extra care unless you want to damage the spring mechanism. Being the most expensive American fridge freezer on the list, it’s only natural that customers expect heaven and earth from the Samsung RS7667FHCBC. I can confidently say that this fridge freezer did not disappoint. With a 4.5 star rating at the time of writing, most of the customers had nothing but good things to say about the fridge. The strong points that everyone’s talking about include the massive storage capacity and unrivalled cooling capabilities. Having read my review back, it kind of does look like I’m actively trying to sell my readers this here fridge freezer. But I assure you, that was not the intention; I aim to be as balanced as possible. It’s just that sometimes you come across a product that is nothing short of brilliant. 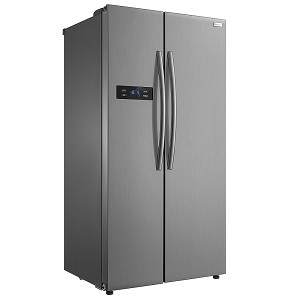 The Samsung RS7667FHCBC American fridge freezer beats the competition from all angles. It’s bigger, it’s stronger, it’s more powerful and packs the latest technologies for unrivalled performance. So if you’ve got a big house with the entire nuclear family visiting over for a while, then the RS7667FHCBC was made just for you. Promising greater performance, generous capacity, an incredible array of flexible features and more value for your money, the RQ560N4WC1 is Hisense’s new four-door American fridge freezer. This big, imposing appliance makes a statement in your kitchen with its near 80 cm width doors and stylish, stainless steel effect. The configuration can be loosely termed as French style because the fridge freezer’s 4 doors open like a wardrobe to reveal 289 litres of storage space, full-width shelves and massive salad drawers. Now, while there isn’t much space for shelf adjustment, they can all be removed to make more space. Hisense really did a great job of incorporating bright, side mounted LED strips that properly illuminate the interior. Another feature that really impressed me was the non-plumbed water dispenser that is easily removable for quick filling. 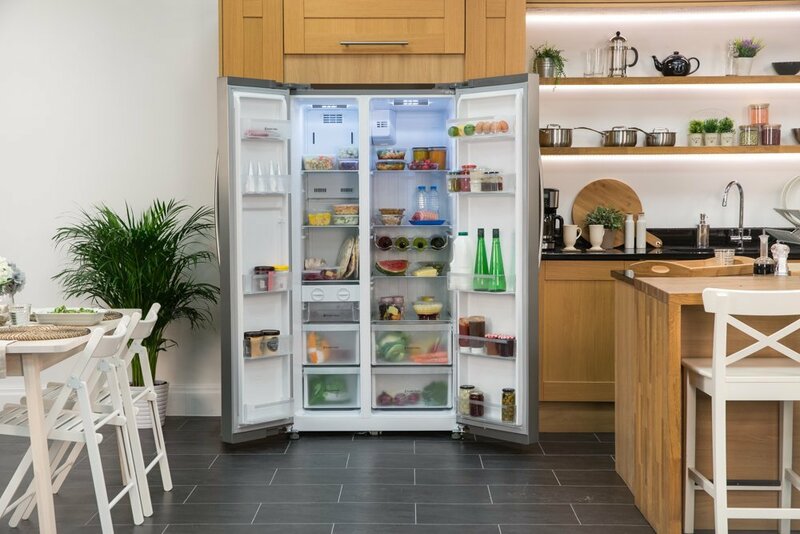 It’s a well-known fact that bigger fridge freezers have to work twice as hard as regular fridges to achieve an A+ energy rating. This is mainly due to the larger surface area and taking on heat from other kitchen appliances. Thanks to the excellent insulation, the RQ560N4WC1 fridge freezer actually makes it closer to the A++ rating considering the size. But as with all fridges, this will largely depend on how many times you access the refrigerator every day as well as how hot your kitchen is. Another area that the RQ560N4WC1 excels is maintaining stable temperature spreads across all the compartments. Given the relatively cheaper price point, you’d expect the RQ560N4WC1 to cut some corners to keep up with the competition. I can confidently say that Hisense did not need to do any of this. However, you’ll notice that the touch controls are a bit awkward and tricky to master since there’s no obvious touch area. Likewise, the shelves and drawers are also pretty basic and require somewhat of a strong tug to open the sliders when fully loaded. Hearing what previous customers have to say about a product is always one of the best ways to get a better idea of what to expect. Being new on the market, the RQ560N4WC1 from Hisense hasn’t received many reviews, but it had a rating of 5 stars at the time of writing. All in all, most customers were pretty satisfied with their purchase give or take a few isolated issues. When you consider the cost, then it’s obvious that the Hisense RQ560N4WC1 is a feature-packed fridge freezer with excellent value for money. With its stable temperature spread, affordable price range, attractive LED lighting, and generous capacity, it’s an appliance that will feel right at home in your kitchen. If you want a decent fridge freezer for your home without spending too much, this is it right here.